Should I Lease Or Buy My Next Audi? At Bill Matthews Audi, we believe in helping our clients and exceeding their expectations when it comes to customer service. That’s why we are here to answer all of your questions and help determine which option is best for your situation. This includes helping you decide between leasing and financing at our finance department. Financing and leasing both offer a wide range of advantages and disadvantages depending on your specific situation. At Bill Matthews Audi, we can help you understand how each alternative will work for your lifestyle to help you make the best possible decision. When you speak with one of our finance specialists, they will take the time to answer all of your questions and explain each option in detail so that you can make an informed decision. If you are hesitating between leasing and financing, come to Bill Matthews Audi today and we will take the time to help you. 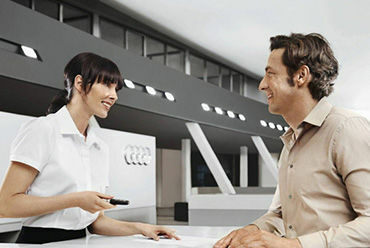 To learn more about our Audi leasing and financing offers, contact us today!